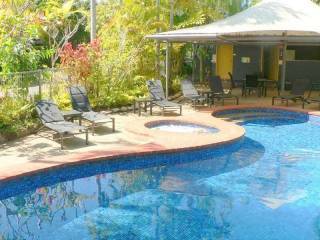 Nimrod Resort Apartments offers modern, self-catering accommodation in Port Douglas, just 5 minutes’ walk from Four Mile Beach. 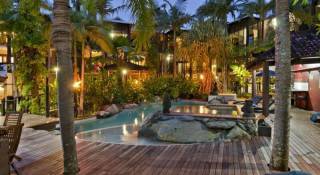 It boasts a large lagoon-style swimming pool and a tennis court. The apartments of Nimrod Resort feature fully equipped kitchens, washing machines and DVD players. All apartments are air conditioned and offer a private balcony or patio area. Guests can enjoy Nimrod’s barbecue facilities. Numerous restaurants and bars can also be found within a 10 minute walk of the resort. Resort Nimrod offers free, private parking for guests. 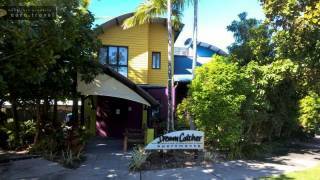 It is located approximately one hours’ drive from Cairns Airport. An airport shuttle can be organised upon request. You have a choice of 2 Bedroom Apartments or 3 Bedroom apartments set on 5 acres of Lush Tropical Grounds. We have a large Lagoon swimming Pool with a childrens pool and spa, Full Sized Tennis Court and Children's Play Ground. All of our Units are fully Self Contained with Full Kitchen Facilities and full equipped Laundries. 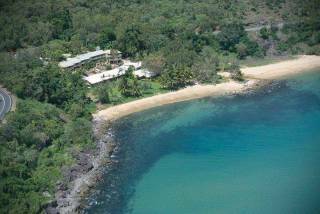 Beautiful Four Mile Beach is within a 5 Minute Walking Distance to the Resort. Within walking distance to near-by resteraunts and the gorgeous Palmer Golf Course. Smoking in your room may cause damage to soft furnishings and need to be dry cleaned which will incur a charge of $400. All tenants are personally liable for any damage to the Units during their stay. Units must be left in a reasonable condition with rubbish removal and dishes clean and put away or a surcharge will apply. No Glass allowed in the Pool area. All Children under the age of 12 must be supervised in the pool area by an adult at all times. All Accommodation must be paid for on arrival. Check in is from 2.00pm onwards unless pre arranged with Management. Check out must be by 10.00am unless pre arranged with Management. We have a within 48 hr cancellation policy that full payment will be taken unless agreed otherwise by Management at their discression. No show bookings will be charged in full. Only the amount of tenants the Unit was booked for are allowed to stay in your room or a surcharge will apply. Only one vehicle per Unit allowed to park onsite.